In The Next Generation Gap, 16-year-old Carter and his dad Denny take on everything from Instagram to dating to music. It’s a revealing look at the different perceptions of each generation, especially when they reverse roles and you get to see what each one thinks the other is thinking. The audience suggests a topic where a 21st century kid might have a different take from his 20th Century dad and they riff on it for a couple of minutes, and then do a variety of scenes based off the topic. When it comes to a teenager and his dad agreeing about anything--whether it's smartphones, dating, music, or curfews--as you'd imagine there's never any shortage of material. The humor comes not just from their different takes on the topics, but their passive-aggressive takes on each others' approaches to life. 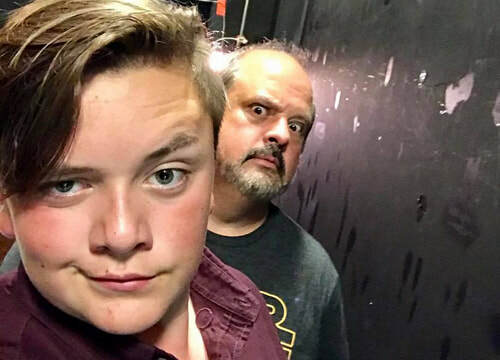 Denny and Carter have been performing improv on-stage together since 2013, when Carter was just 10 years old, and they first performed The Next Generation Gap show in January, 2016. In addition to their work as a duo, they're both also members of East Side Story (long-form) and Split Second Improv (short-form), two prominent groups in that mysterious land across the bridges to the east of Seattle. The Next Generation Gap features Carter & Denny Atkin. This will be their second visit to SFIT.